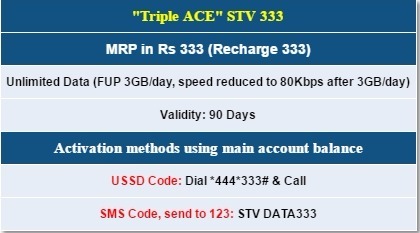 After launching new Unlimited Voice & Data packs, BSNL withdrawn All Free Prepaid..
General News: After launching new Unlimited Voice & Data packs, BSNL withdrawn All Free Prepaid..
General News After launching new Unlimited Voice & Data packs, BSNL withdrawn All Free Prepaid..
After launching new Unlimited Voice & Data Offers - Triple Ace Data STV 333, There is nothing better than this Combo STV 339, Dil Khol ke Bol Combo STV 349 & Nehle per Dehla Combo STV 395, BSNL withdrawn its promotional prepaid mobile plans All Free Plan 144 & All Free Plan 439. As reported earlier, BSNL launched All Free Plan as a New Year Gift to its broadband customers in all the circles. Later, BSNL authorities decided to offer this promotional plan to all new / MNP customers without the precondition of BSNL Broadband connection. The revised All Free Plans 144 & 439 were available for a period of 90 days up to 23-04-2017. Existing customers in these plans may continue to enjoy the benefits till the expiry of their plan voucher. After the expiry, customers may choose any of the existing Plan Voucher denominations as per their choice / requirement. Customers who need True Unlimited Voice Calls to Any network may choose the newly launched Dil Khol Ke Bol STV 349. Under this plan, a customer may enjoy unlimited voice calls to any number in India @ just Rs 349 for 28 Days. A total of 2GB Unlimited data is also available with 349 plan. After 2GB, customers will get unlimited data access at a reduced speed of 80Kbps. Unlimited Plans 339 (There is nothing better than this) & Nehle per Dehla STV 395 are very much suited for those customers who requires heavy data usage and moderate voice calls. There is nothing better than this 339 plan offer daily 3GB unlimited data + Unlimited BSNL Calls + daily 25 minutes free other network calls for 28 days. Nehle per Dehla STV 395 offer 71 days validity which includes daily 3GB unlimited data + 3000 minutes free BSNL Calls + 1800 minutes free other network calls. Both these plans offers unlimited data access with reduced rate pf 80Kbps after the daily usage limit.